Easter is early this year so no wonder it feels come around so quickly! 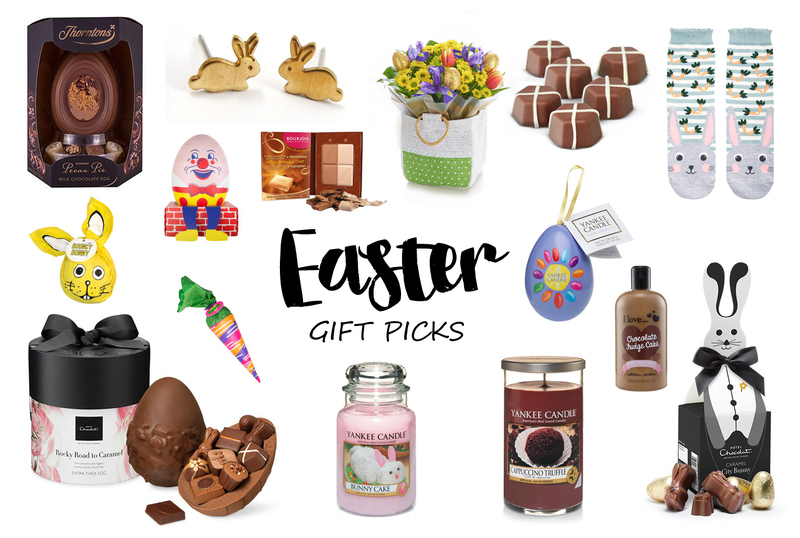 Seeing as how my Mother's Day Gift Picks post went down so well I thought I would share with you my Top 15 Easter Gift Picks to treat your friends, family and yourself with this year whatever your budget. I have both Chocolately and Calorie Free options for you! Chocolate | So I'll start with the calorific picks first. I love Easter Eggs that have pieces of extra deliciousness stuffed within or on the front of them! This Pecan Pie Easter Egg from Thorntons really appeals to me with chopped pecans & their own special toffee packed into the front. I've always dreamed of having a Hotel Chocolat Easter Egg but they're rather out of my price range and I can't really justify spending that amount on chocolate, as much as I'd like to! If I were to get one though it would be this extra thick Rocky Road packed full of cookies, puffed rice and chocolate chunks. I have a few other hotel chocolate picks though that I have tried in the past and loved, make sure you try the hot cross bun chocolates! Beauty | Some lovely Lush gift sets have been released especially for Easter in all sorts of adorable novelty packaging! My favourite is the giant carrot. Both the carrot and the bouncy bunny gift sets have the added bonus of coming with the rare Spring Bunny bath bomb that is exclusive to those sets. I really liked the sound of this chocolate fudge cake shower gel (doesn't that just sound delicious) so I thought that would be a nice indulgent treat for those of you who are trying to have a low calorie Easter! Plus it's only £2.99 a bottle. I also saw this delightful Bourjois bronze/highlighter palette which looks like a chocolate bar. Candles | I did a whole post on my top candles to burn over Easter previously on here. Yankee have a great selection for Easter including Jelly Beans (sweet and fruity predominately of grape, blackcurrant and raspberry) which for the first time has been released as a melt as part of this gift set. Misc | Now for the more random picks! I saw these adorable bunny socks on Accessorize which I just thought were a must have for Spring/Easter, they have little carrots on them! Another option is this pack of 3 Easter Egg socks from House of Fraser. The flowers are from Interflora and include little chocolate eggs which is just a fail safe combination in my opinion. These adorable little bunny earrings are from a seller on Etsy and I think would a great gift for a daughter or best friend who doesn't want chocolate this year. Another pick from Etsy is these chick earrings which look so cute. Etsy have a fabulous selection of Easter Decorations available from their sellers too so check them out if you want some little extras! I hope this blog has given you some present ideas. What will you be getting for Easter this year?